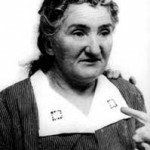 Leonarda Cianciulli was a resourceful woman. She knew how to make use of any leftovers, knew how to stretch a lira. It was the 30s, and money was tight. In those times, you made do.